OK now that our family Christmas party is over I can post about some of these! I saw these really cute decorated Halloween jars after Halloween. I was so bummed that I had missed my chance to make them, but I figured that hey, we could just do Christmas jars instead!! I really thought the kids would enjoy making them, so we made some for us and then we decided to give them as gifts to family. I keep most of my glass jars, and it works best with jars that don't have raised writing on the sides (like Mason jars do). 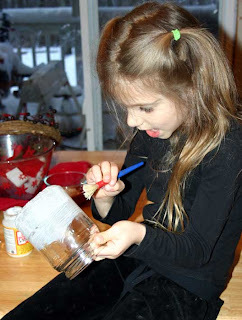 The natural peanut butter jars, pickle jars etc work great. Different sizes are cool too so even smaller jars like jars you can get mushrooms in or stuff like that are cool, even baby food jars may work if you put little tea lights inside. I used tissue paper like in the link above, well, except for the black, that was a streamer (note, the streamers are NOT as sturdy as the tissue paper and rip VERY easily). And you can get some cool printed Christmas type tissue paper too. So as in the link above. 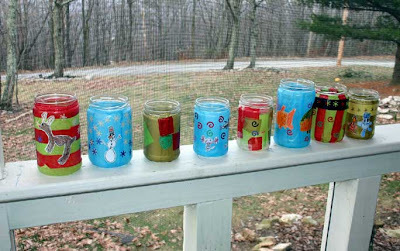 I used Mod Podge (which you can get at any craft store, or even Walmart) painted it on the jars and then laid the tissue paper on in strips (some we did horizontal, some verticle). Then we went back over it with another coat of modge podge and while it was wet the kids added their own decorations. The older kids could do the whole thing themselves, for the younger 2 I helped with the glue and/or the strips. With some I just cut a bunch of squares of paper and let them just stick them where they wanted. They even added glitter to one. We used those little shaped hole punches to make shapes to add, and they drew pictures that we cut out and glued on there. 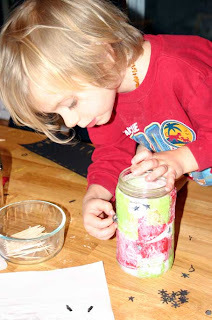 They turned out REALLY cute and the kids enjoyed making them (though it was a bit messy and time consuming). In the end we had a reindeer and snowman jar, a pokemon and Kirby jar and a fish jar. 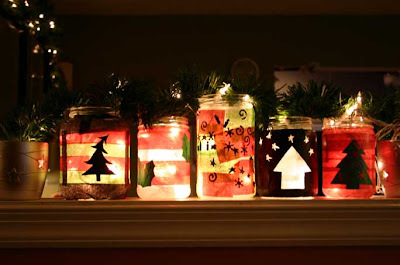 Then some other random christmas themed jars to give away as gifts. I decoupaged their name and age and date on a piece of paper on the bottom. 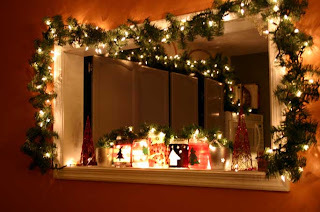 You can put Christmas lights inside them like I did, or they also look really nice with a candle inside too. A friend says they have little battery operated tea lights at the dollar store, those would work really well. They are perfect for a window sill and make great handmade gifts!! These luminaries are fabulous! I love them. I want to be just like Kelley when I grow up! You ROCK! And I love mine. Thanks Piper! 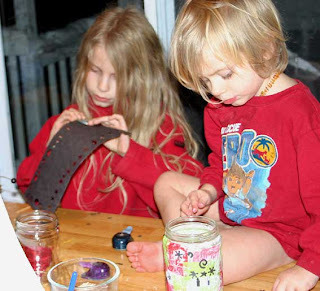 Mod Podge Amy, thanks so much for the compliments and for showing them off on your blog! Your blog rocks BTW, definitely will be checking back for cool craft ideas!! Lindsey, yes I had thought about painting them too, just never got around to trying it. If I had though, I would have probably attempted to seal it with mod podge.